RADIO WAVES: I have so much new music to listen to every week from our mail box and through digital downloads in our email, I will be the first to admit that I don't listen to a whole lot of radio these days. 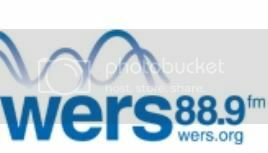 But when I do, the first station I always check out is WERS 88.9 fm Boston. The Emerson College station is a true independent music gem! They play the best new music and a mix of eclectic favorites - often it sounds like they somehow got a hold of my record collection. Today I find myself sitting home, sick (ick) with the flu for the second full day, listening to WERS and enjoying some great programming. This week, WERS is offering listeners a full week of live performances from bands all over the world. Every two hours a new band will be in studio performing live. This is something you just don't want to miss!